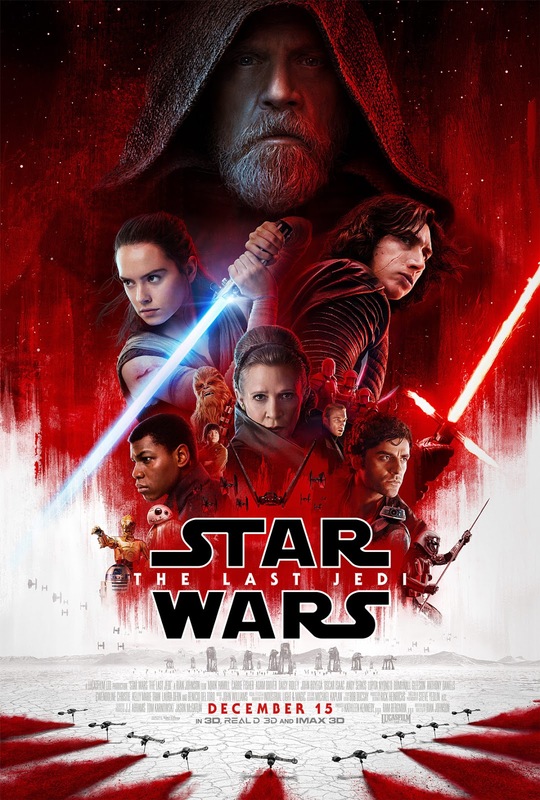 Movie: "Star Wars: The Last Jedi"
The First Order attempts to wipe out what is left of the New Republic and the Resistance while Rey uncovers the truth about the pasts of Luke and Kylo Ren. The "Star Wars" franchise has been around since 1977. What started out as a simple space opera has spun into a cultural phenomenon with devout followers obsessed with all things Jedi and Dark Side. We are huge fans of the series ourselves. When "The Force Awakens" was released, it was a return to form for the franchise, a nostalgia trip that brought back many of the warm and fuzzy feelings we had when we saw the original (now-renamed) "Star Wars: Episode IV - A New Hope." The release of that movie in 2015 spun off fan theories for every single character, no matter how insignificant they were to the overall story. Much like what happened when "The Empire Strikes Back" was released 37 years ago, Rian Johnson's "Star Wars: The Last Jedi" doesn't go how many fans expected it would. Returning to reprise their roles from "The Last Jedi" are Daisy Ridley, Adam Driver, John Boyega, Oscar Isaac, Domhnall Gleeson, Carrie Fisher, and Mark Hamill. New to the cast are Laura Dern, Benicio Del Toro, and Kelly Marie Tran. The story, or at least the portion we are willing to talk about without spoilers, picks up where "The Force Awakens" left off: Rey meets Luke, The First Order continues their rise to power proceeds to wipe out the New Republic and the Resistance. After 40 years as a franchise, us fans thought we knew every beat and every possible direction this series could go. Leave it to Rian Johnson to prove us wrong. As a director, Johnson has broken protocol with past endeavors into the Star Wars universe. He did not choose to follow the formulas of his predecessors in previous installments and sends audiences in a completely unexpected direction. While we can understand why some people will be upset with his bold choices, we personally loved this movie and even enjoyed it more the second time around. Johnson has managed to add something that has been lacking in the past, and that is a depth of character and nuance. This story isn't as black and white as other "Star Wars" films have been in the past. What we thought was pure evil can now be seen as somewhat justifiable anger. Some of the characters people thought to be perfect are little more than flawed after all. The film runs multiple converging storylines that allow for a wonderful arc for the four main characters of this new trilogy: Rey, Finn, Poe, and Kylo Ren. None of these four characters are the same at the beginning of the story as they are at the end of it, and we personally can't wait to see how this trilogy concludes in a few years' time. The acting is great all around and we get to see very layered performances from everyone involved. We absolutely love Daisy Ridley and Adam Driver as Rey and Kylo Ren. Their on-screen dynamic has developed, darkened, and matured a lot since "The Force Awakens." They get some of the best scenes in the film, as do Driver and Mark Hamill's Luke Skywalker. Speaking of Luke, one of the scenes we had hoped would happen actually did, and let us tell you, we cried buckets when it occurred. *for those who have seen the movie, think: hair* To us, the narrative felt super gripping and intense. Each portion lends itself to the development of the characters involved. That being said, while some have complained about the overabundance of humor, going back and watching the series as a whole has shown us that "Star Wars" has definitely been a slyly funny set of films all along (ludicrous goofiness of the prequels excluded). We will admit that some of the comedy doesn't always land and some of the jokes do feel forced. Also, a couple minutes here and there could have been shaved off its runtime despite the fact that we found it to be engaging and well paced from start to finish (truncation is a-okay!). One of our favorite aspects of the film is that old characters have been allowed to evolve in ways we never imagined. These characters feel like people who have had lives off-screen for the past 30 years, lives full of successes and failures that have shaped them into the people we see now in "Star Wars: The Last Jedi." This is a wonderful installment in an ever-growing franchise, but don't go in expecting a rehash of the past because you certainly won't get it. Rian Johnson always kept us guessing, and we found ourselves welcoming his vision with open arms.